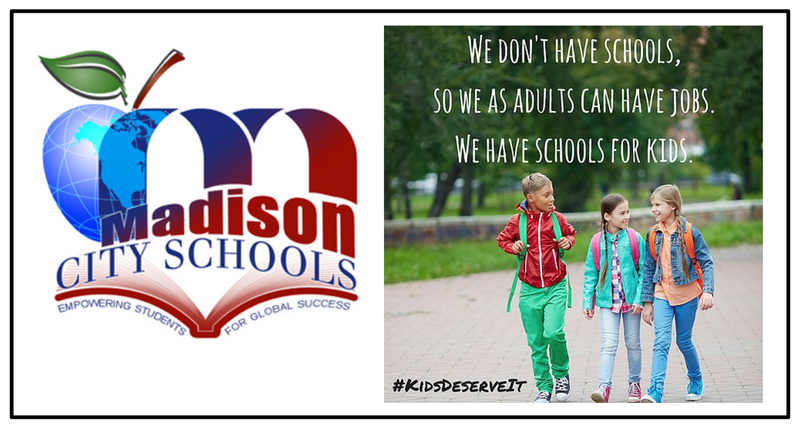 Madison City Schools took a bold, innovative step last school year with the adoption of GAFE and the use of Google Classroom. This year, Dr. Dee O. Fowler, Superintendent of Madison City Schools, continues to be a leader among leaders by transitioning from Outlook email to our GAFE Gmail, thus streamlining communication and allowing for full functionality of MCS GAFE. Change, as we all know, is uncomfortable, messy, and, yes, painful. Ms. Heather Donaldson (Coordinator of Secondary Instruction), Ms. Judy Warmath (Coordinator of Elementary Instruction), Mr. Aaron New (Coordinator of Infrastructure Technology), and Mr. Daniel Whitt (Coordinator of Instructional Technology) are not letting the inevitable bumps of change deter them away from the course that is best for STUDENTS and not succumb to what is easiest for the adults. These leaders KNOW that this change is NOT about what is easiest for the adults but what is most beneficial for STUDENTS. They know and support this change because #KidsDeserveIt! I am proud to be a part of this future ready family of educators. Together, we will hold strong to what is right, good and true for our students!